On this page you can see a selection of horses that I either have imported or exported and horses I have found a new owner for. Here you can read buyers' and breeders' opinions and about their experiences of working with me. stallion, born 2017, seller: C. Debruyne, Quaëdypre, imported to Germany. stallion, born 2016, seller: H. Deyris, Brimeux, imported to Germany. Mare, born 2015, seller: H. Deyris, Brimeux, imported to Germany. stallion, born 2014, seller: B. Grosbeau, Le Titre, imported to Denmark. stallion, born 2013, seller: H. Deyris, Brimeux, imported to Germany. stallion, born 2011, seller: H. Deyris, Brimeux, Imported to Germany. Mare, born 2010, seller: Svend Gundesen, Kolonisthuse, later sold to Sweden. Mare, born 2010, seller: B. Grosbeau, Le Titre. Imported to Denmark. approved stallion, born 2008, seller: C. Debruyne, Quaëdypre, imported to Denmark. Mare, born 2008, seller: G. Goeusse, Herly. Imported to Denmark, later sold to Germany. Mare, born 2008, seller: B. Grosbeau, Le Titre. stallion, born 2008, seller: S. Déclémy, Marquise, imported to Denmark, later sold to Germany. mare, born 2007, seller: Denis, Campagnes les Boulonnais, imported to Denmark, later sold to Switzerland. mare, born 2006, seller: M. Debruyne, Quaëdypre, imported to Germany. stallion, born 2006, seller: M. Cuvillier, Henin sur Cojeul, imported to Denmark, later sold to Germany. 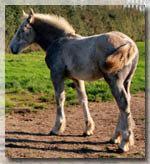 mare, born 2006, seller: B. Deyris, Marenla, imported to Denmark. gelding, born 2005, seller: P. Blondel, Lisbourg, imported to Denmark. mare, born 2005, seller: B. Grosbeau, Le Titre, imported to Germany. mare, born 2005, seller: M. Debruyne, Quaëdypre, imported to Denmark. mare, born 2005, seller: Lesage, Roeux, imported to Denmark. mare, born 2005, selleer: H. Deyris, Brimeux, imported to Denmark. approved stallion, born 2003, seller: M. Bulot, Flechin, imported to Denmark, later sold to Germany. gelding, born 2003, seller: M. Debruyne, Quaëdypre, imported to Denmark. mare, born 2003, seller: Vasseur, Samer, imported to Denmark, later sold to Germany. mare, born 2003, seller: Decoubert, Hernicourt, imported to Denmark, later sold to Germany. mare, born 2003, seller: E. Degardin, Abbeville, imported to Denmark. mare, born 2002, seller: T. Denis, Campagnes les Boulonnais, imported to Denmark. mare, born 2002, seller: M. Deyris, Marenla, imported to Denmark. mare, born 2002, seller: M. Denis, Campagne les Boulonnais, imported to Denmark. mare, born 2001, seller: T. Le Marchand, Coudekerque, imported to Denmark, later sold to Germany. approved stallion, now castrated, born 2001, imported to Denmark. 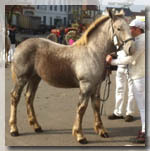 mare, born 2000, seller: S. Déclémy, Marquise, imported to Denmark. approved stallion, born 1996, seller: G. Lenne, Boisjean, imported to Denmark. mare, born 1994, seller: B. Deyris, Marenla, imported to Denmark, later sold to Germany.